After used clothes and old newspaper, it is now the turn of bicycles. These used and old bicycles are transforming the lives of poor school going children in rural areas of Bhopal, reports Shuriah Niazi. Aham Bhumika, an NGO, has been collecting used and old cycles from the people and donating them to poor school going children. In villages located outside Bhopal, there are large numbers of poor children walking miles to attend school. These children could be assets to the society once they complete their studies. Life has changed completely for Bhel Singh, a tribal student. Earlier he had to walk 6 kms from his home to school and from school to home. 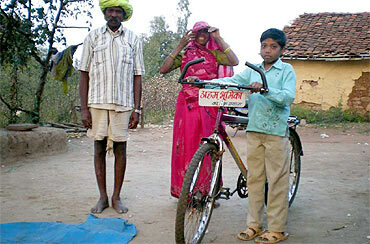 But now he has a cycle to go to school, donated by Aham Bhumika. "Now I need not walk to school. I have a cycle and I can go to school easily without any difficulty," said Bhel Singh. Aham Bhumika started this initiative almost a year back. In the first phase, they collected 38 bicycles, including 16 small ones. 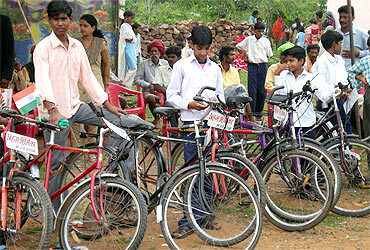 The small cycles were given to Aganwadi centers and remaining to the students of Government Middle School. Subrat Goswami, along with some of his friends, started Aham Bhumika in order to help these poor children. They started 'Donate Old Bicycle Campaign' last year. 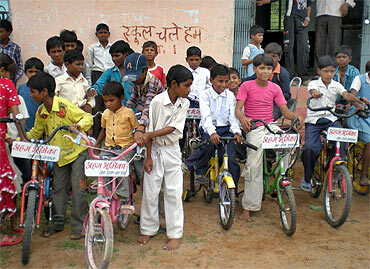 On August 15, 2009, they provided the first set of cycles to the school students and Aganwadi centers. Subrat Goswami, Aham Bhumika's programme coordinator says "Countless cycles are lying unused, and rusted in every apartment, colony, houses. If repaired, just by spending few rupees, the same cycles may be of immense use for the needy children who have to walk a long distance to attend the school. These cycles could really help poor school going children." He says that these children just love to go to school, but have to walk miles for attending. "Through our small effort we could help them in achieving their goal. Aham Bhumika is not only collecting cycles, but also toys and clothes to be distributed to slum children in Bhopal," he adds. A small effort by Aham Bhumika is transforming lives of these children. Why can't the Congress force its allies to behave?